The Key West will be perfect for your Florida sun-room. If you don’t have one you’ll feel like you do! Shown above in White finish. The Continental Promo Collection is dollar-smart. All our Continental frames come ready to assemble in a very small box. Reducing factory assembly and keeping transportation cost down boosts your value-for-money. 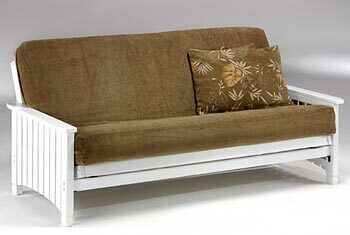 What you get when you've put it together is a beautiful, solid, quality futon frame; you won't find a penny scrimped or a corner cut in that department. All Continental Promo Collection items come with a limited 5 year warranty.